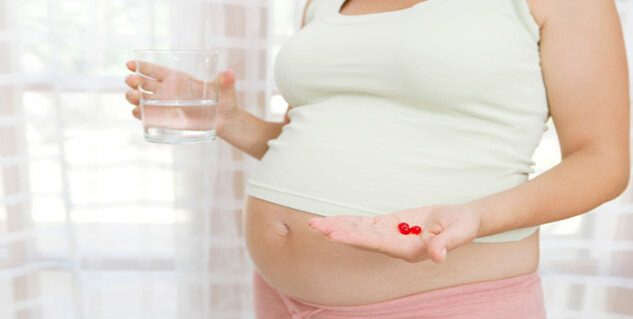 Vitamins requirement is higher during pregnancy. Women try to get more vitamins from foods and supplements. Fat soluble vitamins can reach toxic levels when in excess. Vitamins are important for our body and they become even more important for a pregnant woman as they are vital for proper fetal growth, development, and healthy adult living. About half of all the pregnancies are unplanned which leave no time for women to plan their diet and enhance the vitamins intake so that it meets the requirement. However the requirement is usually high during pregnancy, for example a- pregnant woman is recommended to take about 400 micrograms (mcg) of folic acid daily during the initial 12 weeks of pregnancy. To help create a healthy and nutritious environment in which the baby can develop, pregnant women are recommended to switch to a well-balanced diet which is rich in all the necessary vitamins. But it's not that easy to get all the vitamins a mother and her baby need, from even a broad range of foods including dairy products, fruits, vegetables, meat, grains and legumes. Therefore, as commonly recommended by all the doctors, most women try to get the required amount of vitamins through prenatal supplements along with a healthy diet. Such vitamin supplements become even more crucial source for women with certain diets and dietary restrictions and health issues. However it is also common for pregnant women to start taking vitamins supplements and vitamin rich foods more than the recommended limit. It may result in excess intake of vitamins which may have certain side-effects during or post the pregnancy. For pregnant women who decide to supplement their diet with synthetic nutrients, it becomes very important to keep track of their daily intake, and let their health care provider know about it. It is possible to overdose on certain vitamins, which could have adverse effects on the mother as well as the growing baby. Women who rely heavily on supplements for the vitamins intake rather than naturally occurring foods, are more at risk of getting excess amount of vitamins in the body. While vitamin supplements are an easier option, it is always better to fulfill the nutritional requirements through natural food sources. And if you decide to rely more on supplements, you must be aware of the recommended amounts of vitamins that are required during pregnancy. Vitamins are either water soluble or fat soluble. All the vitamins that are water soluble are usually harmless even in excess amounts as they are dissolved in water and the body will flush them out through urine. The excess amount of water soluble vitamins can still be discomforting because of the irritating effects they can have on the digestive system. Unlike water soluble vitamins, the fat-soluble vitamins like Vitamin A, D, E and K are stored in the body. If you take more than the required amount of these fat soluble vitamins then the excess amount is stored in your liver and body fat, where they can even reach toxic amounts causing severe side-effects on the mother and the baby. The toxic levels of that soluble vitamin can cause complications during pregnancy and even cause negative effects on the normal growth of the baby. There can be some mild side effects as well including hair loss, fatigue and pain. When vitamins occur naturally in foods, they exist in favorable amounts that the body can easily manage. Considering the harmful effects of excess amounts of vitamins, especially the fat soluble ones, it is better to depend more on the natural sources of vitamins and less on the supplements. Also make sure to stay in touch with your doctor regarding every detail during your pregnancy.